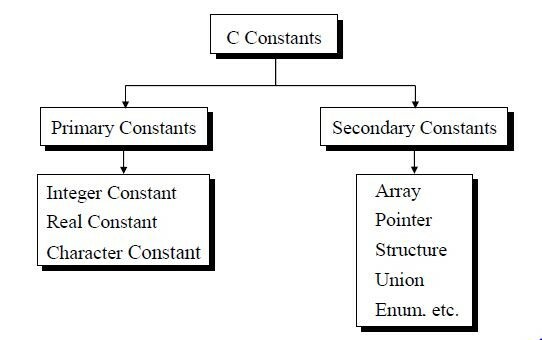 Primary constants are of three types. Integer constants are the sequence of numbers from 0 to 9 without decimal points or fractional part or any other symbols. Ex. : 5, 15, -20 etc. If no sign precedes an integer constant, it is assumed to be positive. Ex. : 5.5, 15.213, 3.14 etc. Real constant must have at least one digit. No commas or blanks are allowed in real constants. Character Constant is a single character. Ex. : ‘A’, ‘S’, ‘5’, ‘=’ etc. A Character Constant is a single alphabet, a single digit or a single special symbol enclosed within single inverted commas.